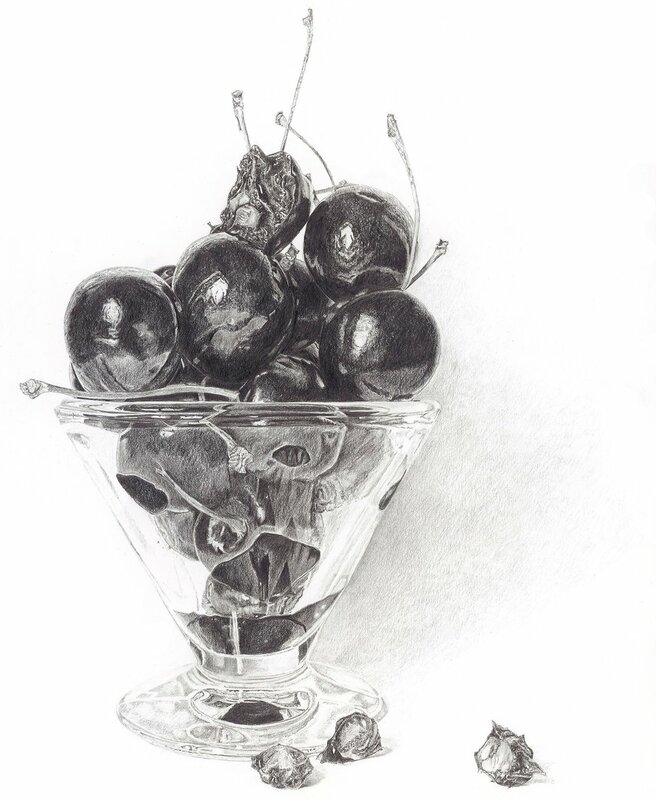 I wanted to continue exploring the theme of refractions and contained food. I gently pressed the cherries so their juice forms shapes against the glass. The inspiration for this painting came from several places. When I think about cherries there is a mishmash of colour, images and memories from playing fruit machines at Butlins in Minehead and winning the 50p jackpot, hooking a pair of cherries over my ears and pretending they were earrings, the “Have another cherry” scene from The Witches of EastWick film too my collection of Cherry B glasses. The composition was inspired by a recent visit to see an exhibition of Andy Warhol’s illustrations from the book Wild Raspberries by Suzy Frankfurt & Andy Warhol. I particularly liked the head on view point and the piling up effect of the dishes. 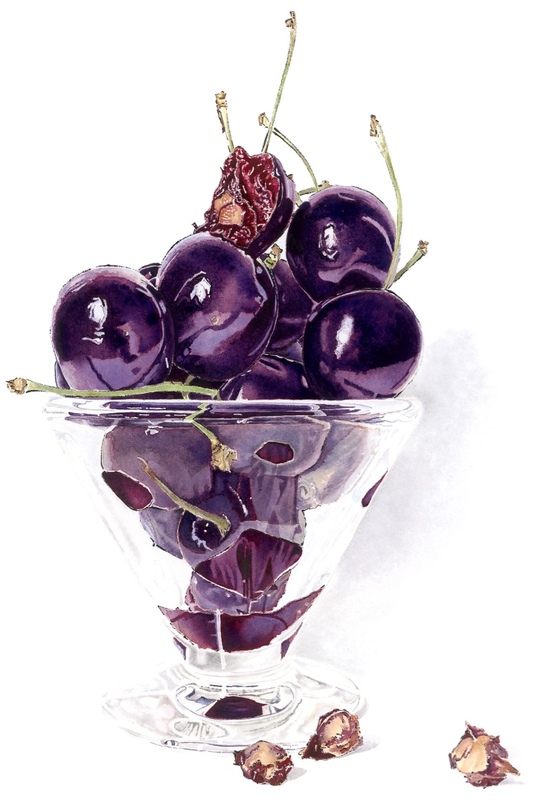 One of the challenges I set for myself with this piece was to capture the shine and highlights of the cherries. I used mainly 5B, 7B and 9B pencils that helped create the contrast between the dark and light areas. It was interesting to observe that the reflective qualities of the fruit out shone the surface of the glass. 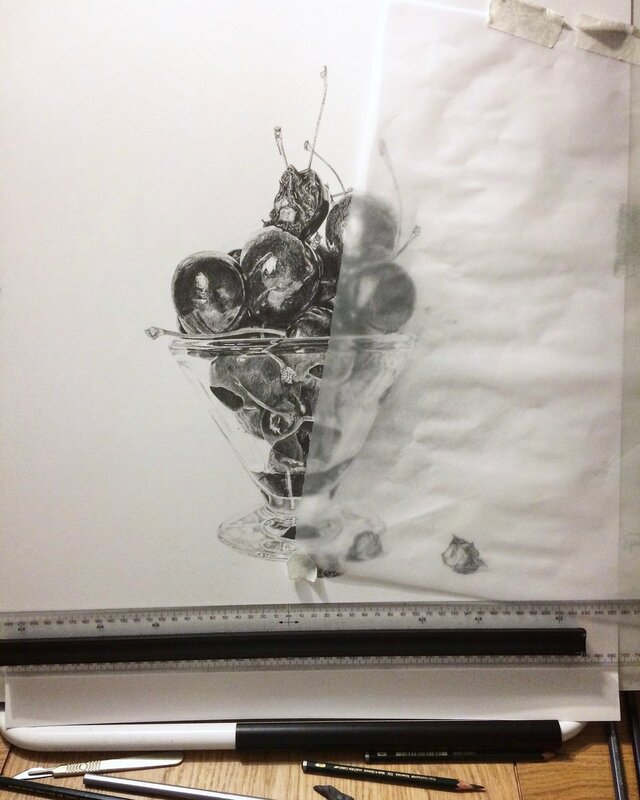 To create the blotted line print I first trace my drawing, then once transfer it onto stretched watercolour paper. I like to use smooth hot pressed paper as I find it easier to print on. There was a beautiful contrast between the colours of the top cherries and the ones squeezed into the bowl. The top ones were an intense deep purple while the others had a soft dusky grey bloom. There is something rather special about eating cherries in season, they always seem to taste sweeter in the summer, during the winter I make do with an occasional kirsch soaked cherry covered in chocolate. They remind me of summer days and seeing how far I can spit their stones. Bite is now available as a Giclee print and greetings card, for more information please visit the shop page.